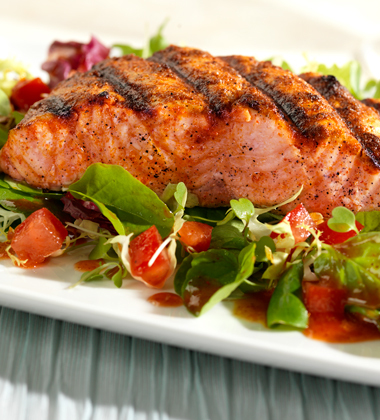 BBQ-grilled salmon is brushed with a spicy sauce that includes V8, and served on top of a salad with greens, tomatoes, cucumbers, carrots and corn. 1. In covered container whisk together juice, vinegar, sugar and half the spice rub mixture and mix well. 2. Whisk in olive oil and then scallions to finish. Cover and refrigerate at least 2 hours before serving. Reserve 2/3 of BBQ sauce for basting fish while grilling and remainder to use as a salad dressing for completed salad. salmon fillet, boneless, 6 oz each	 9 lb. 3. Place fish fillets on a sheetpan in one layer and sprinkle evenly with remaining BBQ spice rub. Cover and refrigerate at least 2 hours or overnight before cooking. 4. Before grilling, spray each seasoned fillet with non-stick cooking spray and grill, over high heat, seasoned-side down over fire for 1 minute. Turn and baste with BBQ sauce several times for 2 minutes over top of each fillet until fish flakes easily when tested with a fork and internal temperature is 165°F. or higher for 15 seconds. CCP: May be served hot 140°F or higher, or chilled 40°F or lower. 5. For Each Serving: Place 2 cups greens on chilled dinner plate. Top with 1/2 cup chopped tomatoes, 1/4 cup each: diced cucumber, shredded carrot and corn kernels. 6. Place a cooked fish fillet over top of salad and drizzle with 2 tbsp. BBQ sauce to serve. Ingredient Options: Other fish may be used instead of salmon such as tilapia, trout, tuna or catfish, but cooking times will change according to fillet size and thickness. Also, other additions may be made to the salad including fresh fruit (pineapple, mango, papaya, etc.) 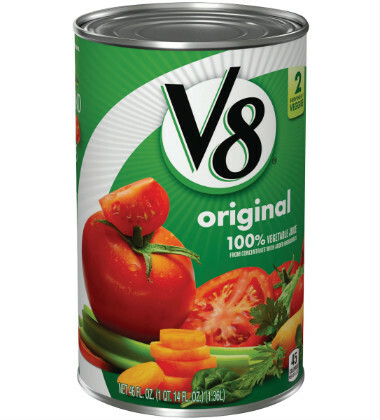 as well as other vegetables such as zucchini, yellow squash, fennel, etc.